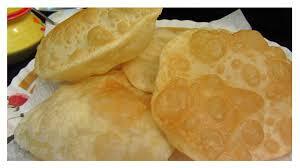 Ten most delectable variegation of Indian breads in India ! India ,a country with variety ! Where everything is diversified .And so , is the food out here . With the heterogeneity of states here ,comes the variegation of culinary dishes .with an array of savory gravies and rice , India also prides in owning a miscellany of Indian breads too . 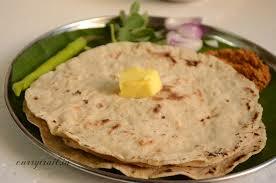 Indian breads form a very role in every meal for the inhabitants here . We always enjoy a part of our main course with either one of these breads . Which ones , it varies from states to states or cities to cities for that matter. In here, I have tried to some up the ten most known and palatable kinds of Indian breads and which specialize from some prominent states of India. Let’s get aquinted to them in order to ravish Indian meals fully. 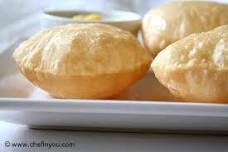 Soft , small , round shaped breads those are made from all purpose flour , salt ,baking powder and water together kneaded to form a soft dough and later deep fried and enjoyed best with vegetable gravies or ever sweet dishes like kheer sometimes. Luscious round breads made from kneading together curd ,all purpose flour , salt , sugar and butter and tandoored to perfection and paired with non vegetarian savories. bread a little tougher in texture than the kulcha but more relishing to enjoy. This is made of castor sugar , milk powder ,instant yeast , kewrah water ,butter , cream and egg mixed with lukewarm water to form a dough and baked to perfection in a clay oven and enjoyable with any type of liquid gravies or even just like that .
! 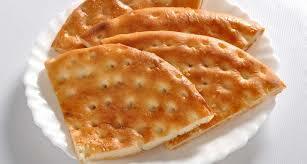 A pun jab native in origin this bread is considered as one of the healthiest and tastiest in India. 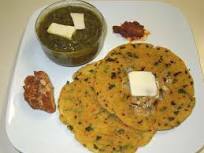 Prepared with maize flour and Cooked on low flame it tastes scummy yummy with sarso ka saag topped with generous amount of home made butter on it. originated from the Konkan region . Again a healthy version of toothsome bread made with jawar ,bajri,ragi or rice flour kneaded with water and cooked to enjoy with dal .
. A combination of flour , salt , sugar mixed with butter , a pinch of saffron and baked in clay oven to enjoy with exotic gravies.
. A Bengal bread that’s made by mixing maida flour with spoonful of ghee and deep fried to enjoy with all types of liquid savories . 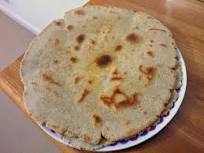 north Karnataka, prepared from jowar flour kneaded with plain water and shaped with palm movements is said to be one of the most scrumptious native breads here . 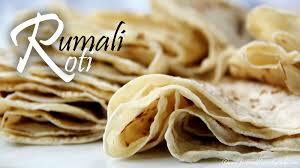 of India .Rumali means handkerchief in India. These are thinnest form of breads made from kneading all purpose flour with water and shaping round and thinnest and widest roties that are later Cooked on down-turned iron pans. a sweet kind of bread especially enjoyed in the Konkan regions of India is prepared by mixing flour with gram dal (grinned) and mixed with jaggery and grated coconut enjoyed mostly after meals . These can be called as only a quarter part of those breads that are so immensely enjoyed in India .A wide miscellany of these are yet either unfounded or not publicized yet .But we still enjoy those dainty delectable breads with all our meals and invite most of them who want to relish awesomeness to try out these delicious type of meal which intensifies the joy of having a complete meal with exotic taste !! Previous Post Fashion review – oranje clothing a feast for fashionistas ! Next Post Restaurant review – 5 Spice , Mumbai Central !